Customer Support | Mehta Tech, Inc.
Mehta Tech personnel are with you every step of the way to ensure that your fault/disturbance monitoring equipment is designed, built, intalled, and operates to bring you the data you need to make critical decisions. 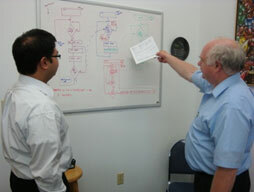 Our project engineers handle all of our project activities. Their primary responsibility is to prepare a project DATAPACK for manufacturing to build the equipment to meet our customers’ requirements as defined in their specifications. Mehta Tech delivers equipment as a collection of sub-assemblies for customers to wire into their own panels or cabinets. When specified, we also deliver our equipment as complete cabinet-housed systems for installation in substations. In either case, our customary practice is to test the equipment with site specific data to assure that the delivered system is properly calibrated and tested for our customers’ settings. In most cases our customers install and start up the equipment without further testing. For the DFR/PMU configuration, we provide additional services to our customers for the phasor measurement application and for engineering an integrated approach to fault (triggered waveform data), disturbance (continuously stored data) and phasor streaming. Mehta Tech, Inc. has the experience, staff, and technology to meet our customers’ technical commercial requirements for Integrated Digital Fault Recorder (DFR) and Phasor Measurement Equipment (PME) on a timely basis. Once your equipment is commissioned, our technical support staff are available by telephone and e-mail to make sure that your recording system delivers the data you need. Mehta Tech recorders use modular construction that makes upgrading for more advanced applications easy to do in the field or in our factory.